A sports sedan that offers exhilarating driving performance and uncompromising refinement. It looks every inch an F model; the spindle grille, the distinctive mesh pattern, monstrous quad exhaust diffusers and carbon fibre spoiler. If ever there was a car that had the power to quicken all the senses, it's the GS F. Each time you take your seat in the driver-focused cockpit, the feeling of almost limitless acceleration is tangible. You are surrounded by luxury, refinement, and a sense of serenity - that is, until you unleash the power underneath your right foot. This is the GS F, the next expression of F performance. Hand built and stethoscope tuned, this incredible 5.0-litre V8 engine develops 477 DIN hp and 530 Nm of torque; its sound alone sets the heart racing. The V8 engine delivers power via an 8-speed Sport Direct Shift sequential transmission with manual override to enjoy raw sports performance. 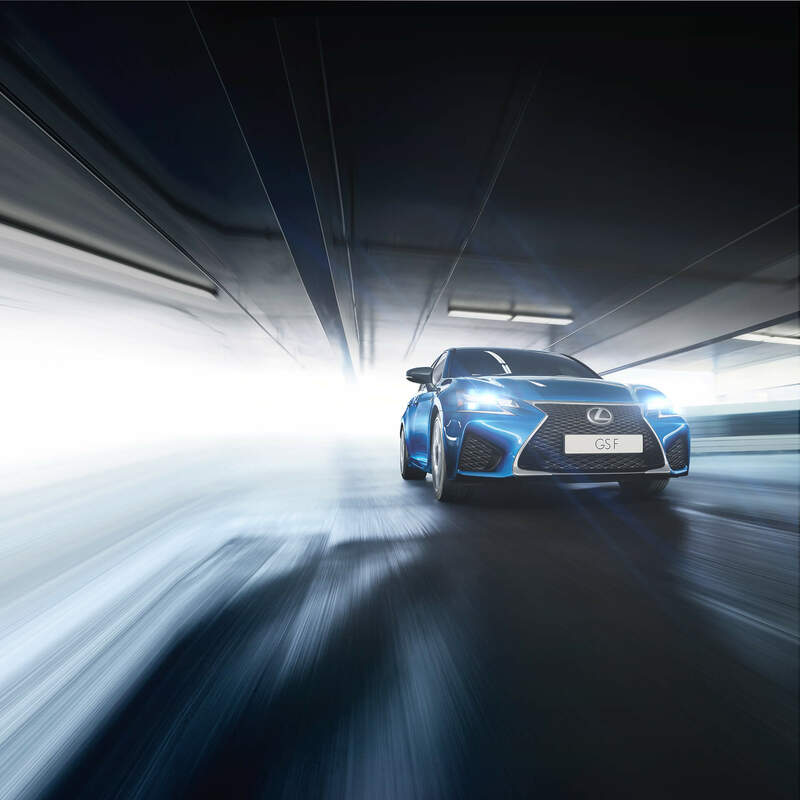 Sports Vehicle Dynamics Integrated Management (VDIM) ensures that the enormous power of the GS F can be enjoyed smoothly and safely. All-new high-back seats featuring the distinctive F marque. At every turn, the integrated foam structure supports you like an athlete's body suit. Thick grip steering wheel offering you a greater control during performance driving. Faster, tighter gear changes with paddle shifts in a natural and intuitive position. Drivers can adjust the sound of their GS F by switching to SPORT S or SPORT S+ and engaging the active sound control to emphasise its deep exhaust note. Begin tailoring the GS F your requirements, experiment with colour preferences, or continue onwards to explore features and the gallery. Let's cut to the chase; this is the most powerful sedan we've ever offered. The GS F sits wide and menacingly low, with every contour wholly committed to one goal - unadulterated performance. No matter how many times you remind yourself it's a five-door sedan, it will take great pleasure in demonstrating its F Performance pedigree. Featuring world first nanoe® technology, the new GS F cabin is divided into three electronically controlled climate zones. Front seat occupants input their individual settings via Remote Touch or the front panel, while rear passengers control their zone using a dedicated panel. Select Manual mode and use shift paddles to enjoy rapid sports performance. When paddle downshifting (in just 0.2 seconds) you’ll experience the unique sound of the throttle ‘blipping’ between gears. Vehicle performance can be fine-tuned using Drive Mode Select. ECO mode reduces emissions and conserves fuel while, for everyday driving, NORMAL provides an ideal balance of power, economy and ride comfort and CUSTOMIZE lets you adjust the GS F to suit your mood. For enhanced drivetrain responsiveness, simply switch to SPORT S or SPORT S+ mode. The Road Sign Assist (RSA) system on the new GS F recognises traffic signs using the windscreen mounted camera, and provides information to the driver in the multi-information display. RSA can detect signs that are compliant with the Vienna Convention (including electroluminescent and flashing signs). The GS F has a thick grip steering wheel that offers greater control during performance driving. The placement, shape and operation of the wheel’s paddle shifts have also been optimised for fast, accurate gear changes. In addition to an immensely strong passenger safety cell, occupant protection is provided by ten sensor controlled airbags. All seatbelts, except for the centre rear seat, are also specified with pre-tensioners. The driver and front passenger are protected by 2-stage head airbags, as well as knee and side airbags. Outer rear seats are equipped with side airbags as standard, while curtain shield airbags run the full length of both cabin sides. This exceptional level of safety protection is provided as standard in the new GS F. As a result, injury risk is significantly reduced. The outer rear seats can also be individually heated via a convenient control panel. Located in the rear centre armrest and featuring an LCD display, this panel can also be used to set the rear climate zone, control the audio and operate the rear blind. All-new high-back seats feature Lexus’ ‘integrated foaming’, which gives a cosseting, highly supportive fit. This motorsport-inspired technology allows greater comfort and lateral support than is possible with conventional upholstery. The driver and front passenger can heat or ventilate their seats. For a more relaxing drive, Adaptive Cruise Control maintains a set distance between the new GS F and the vehicle ahead, even if that vehicle varies its speed. For an even more dynamic drive, Adaptive Variable Suspension - now standard on the GS F - intelligently controls the damping force on all four wheels. This not only improves ride comfort, but also increases handling stability - especially during higher-speed cornering. Designed to further heighten driving enjoyment, the GS F features a Torque Vectoring Differential with three operating modes: STANDARD, for a balance of agile performance and high-speed stability, SLALOM, for an emphasis on nimble response to steering inputs and TRACK, for consistent, stable cornering behaviour while circuit driving. Lane Keeping Assist (LKA) uses a camera in the front windscreen to monitor your position in lane. If you start drifting out of lane, LKA will activate a warning buzzer and give brief corrective steering input. Millimetre-wave radar and an on-board computer calculate collision risk ahead. If the risk is high, the driver is alerted by audible and visual warnings and brake pressure is increased. When a collision is deemed unavoidable, the brakes will be applied automatically as necessary and the front seatbelts tightened. Drivers can adjust the sound of their GS F by switching to SPORT S or SPORT S+ which engages Active Sound Control. This amplifies the car’s deep exhaust note for all occupants to enjoy, perfectly complementing the sporty driving experience. The foundation for the new GS F’s outstanding handling is its high rigidity body. Numerous specialised manufacturing techniques further enhance strength, including body adhesives, laser-screw welding and multi-spot welding. Straight-line and cornering stability are supplied by a multi-link rear suspension setup. A combination of high-tensile steel and die-cast/forged aluminium components keep weight low but ensure vibration-free precision. Discover the GS F from all angles.